Atlanta’s Emory University seems to keep making the same headlines over and over again: record setting gifts announced by the family foundation of Robert W. Woodruff, the late leader of the Coca-Cola Company. It happened again last November. Emory announced it would receive one of the largest gifts in the history of higher education. This time it was $261.5 million from the Woodruff Foundation. 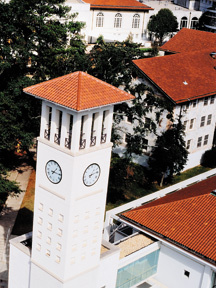 Ten years earlier, the foundation gave Emory an even bigger gift: $295 million. And back in 1979, the brothers Robert and George Woodruff gave Emory a gift that now sounds relatively small, $105 million, but was in fact at the time the largest single donation ever to an institution of higher education. The New York Times stripped the news across the front page. But the untold story, according to those closely involved with Emory since the 1970s, is the dramatic transformation that has taken place since that first record-setting Woodruff gift. And now, even with Atlanta and Georgia relatively unaware of the scope and caliber of Emory’s work, another transformation is on the horizon with this new gift. It’s expected to propel the institution into a renaissance of its medical services, the enactment of a new strategic plan for the entire institution and a capital campaign that will take Emory to the higher echelons of universities around the nation. What makes that 1979 gift most remarkable now, Paul says, is how wisely and effectively Emory used it to create a rich endowment and build a critical mass of facilities and programs. “It couldn’t help but have a positive effect, but it would have been possible for it not to have a transformational effect,” he says. On top of that, Emory offers nationally recognized graduate programs in arts and sciences, business, law, medicine, health sciences, public health, nursing and theology. Emory’s northeast Atlanta campus also houses the national Centers for Disease Control, the Yerkes National Primate Research Center and Emory Healthcare, Georgia’s largest and most comprehensive health-care system. The latest Woodruff bequest signals the dawn of a new era at Emory. Most of the money – $250 million – will be used to modernize and expand the outpatient care facilities of Emory’s Woodruff Health Sciences Center. Another $9 million will be go toward renovating the Health Sciences Center administration building. But a part – a $12.5 million part – has been set aside in a Presidential Fund to advance Emory’s new strategic plan. The plan was created three years ago as a collaborative effort among the faculty, staff and a new administration that began with the hiring of current president James Wagner. Indeed, President Wagner reads from the plan with the exacting reverence of a Sunday school teacher quoting the good book. The plan’s executive summary is nine pages long. It boils down to five strategic themes, each with three or more university-wide initiatives. Those themes are: strengthening faculty distinction, preparing engaged scholars, creating community-engaging society, confronting the human condition and human experience and exploring new frontiers in science and technology. The plan is the result of an intense 18-month long inquiry and seeks to lay out a blueprint for Emory’s growth and development over the next decade. “Our silos can only go so high, but if we build bridges, our silos can get higher and higher,” Wagner says. Indeed, one of his most favored goals is the development of interdisciplinary partnerships inside and outside the university. Some of Emory’s “bridge” programs have combined learning between different schools, such as medicine and law or even literature, nursing and religion, theology and law. “Partnership goes beyond academic,” Wagner says. “Emory is trying to be a good neighbor.” That includes everything from supporting the work of the neighboring Centers for Disease Control by developing new drugs to fight worldwide diseases such as AIDS, to reducing traffic around the extremely congested area near campus. Wagner cites an initiative to stop subsidizing parking and start encouraging walking, shuttle buses and even “flex cars” – one-hour rentals that allow employees to leave their cars at home. Beyond that, Wagner has led the faculty in a trend toward gas-saving hybrids. The Emory faculty and staff parking lot is one of the few places in Atlanta where Toyota’s Prius and Camry hybrid models seem to outnumber SUVs. Wagner puts this in the category of good stewardship, a term he also uses for the management of the phenomenal gifts Emory has received from the Woodruffs and other family foundations. And he says the university is in the silent phase of another capital campaign that he hopes will take Emory to the next level of excellence and national recognition. One effort that’s sure to help make the school more accessible is Emory Advantage, a program of financial aid initiatives designed to help lower and middle income students and families reduce debt incurred during undergraduate years. It, along with two additional scholarship initiatives also rolled out in January, will be funded by the strategic plan – for the first five years – to the tune or $7 million per year. One of those colleagues is now Salman Rushdie, author of The Satanic Verses, and one of the world’s most celebrated writers, who recently announced he will join the faculty as distinguished writer in residence and place his archive at Emory’s Woodruff Library. Another is His Holiness the XIV Dalai Lama who was named Presidential Distinguished Professor in February. Also on that list: former president Jimmy Carter and the staff of the Carter Center, which works in partnership with Emory. There are also internationally recognized doctors and researchers in the School of Medicine and the School of Public Health, which works in partnership with the federally funded Centers for Disease Control. Johns and Wagner are both particularly enthused about Emory’s geriatric research, which they say will help the country distinguish the difference between simply existing for longer and actually living. And change they will at Emory in the near future with the Woodruff gift that will build new, state-of-the art facilities for the hospital. Johns says the new buildings will feature not only the latest and best medical equipment but even state-of-the art architectural design. For example, he says, recent research shows surgery patients recover more quickly if they are exposed to sunlight. Thus, new recovery rooms will feature large, sun-filled windows. Johns’ “community” – the medical side of Emory – is about as complex, sophisticated and large as any imaginable. The medical complex makes up more than half of Emory’s $2.5 billion annual budget, notes Mike Mandl, executive vice president of finance and administration. The other half goes to education and research at the university and all its related schools and programs. Of Emory’s 22,000 employees, about half are in health care and half on the academic side. Emory overall has been growing at an annual rate of about 10 percent during the past five years, Mandl says. But research funding has been growing at a rate of about 15 percent. Emory’s endowment has grown to $4.6 billion, thanks largely to “the gift” announced in 1979. This newest Woodruff gift will not go into the endowment, but mainly into new buildings for the Emory Clinic complex across Clifton Road from the present Emory Hospital on land currently occupied by the Emory Clinic. Plans call for a combination of patient, research and office space designed to integrate research and clinical care in an “ideal patient experience,” from parking, arrival and check-in to examination, treatment and discharge. Emory also plans to partner with other groups to support neighborhood improvements around its campus, including a mixed-use residential and retail development near the CDC. But if Emory’s story is understated, it probably won’t be for long. Since the latest Woodruff gift, Mandl and others involved with the university foresee another major transformation – and they plan to keep telling their story.